Good news—we just awarded a five-year contract to the Coriell Institute for Medical Research to continue and expand operation of the NIGMS Human Genetic Cell Repository (HGCR) . A lot of NIGMS grantees who do basic research may not be familiar with the HGCR. 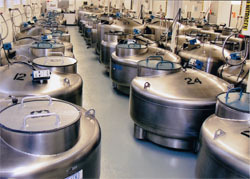 It currently has more than 10,000 cell lines from individuals who have genetic disorders and those who do not. The cell lines, each of which has been comprehensively characterized and is contaminant-free, represent nearly 1,000 disorders. An equally important element of the HGCR is the human variation collection, which includes samples from populations around the world. Under the new contract, the repository will continue to acquire, characterize and distribute cell cultures and DNA samples. In the coming months, it will add induced pluripotent stem cell lines that researchers can use to study inherited diseases and the regulation of normal cell differentiation. To respond to the changing needs within the genetics community, the repository will also start accepting custom orders. One of the real advantages of ordering materials from the repository has been and certainly will continue to be the high level of characterization and quality control. You can read more about the repository in the NIGMS news release. You can also go to the HGCR online catalog to see what cell lines are available. If you’ve used the repository, let me know what you think. If you haven’t, keep it in mind for future studies—it’s a great resource for getting good quality human cell lines, especially ones that may otherwise be difficult to obtain. Less than two months ago, NIH announced a new initiative, the Basic Behavioral and Social Science Opportunity Network (OppNet). Richard Hodes, the director of the National Institute on Aging, and I co-chair the steering committee for this exciting, trans-NIH effort. The first year of OppNet activities will use $10 million in Recovery Act funds and focus on short-term efforts to develop existing programs’ capacity for conducting basic behavioral and social sciences research. Starting in Fiscal Year 2011, OppNet will be supported through NIH’s pool of common funds shared across its institutes and centers. Recovery Act Limited Competition: NIH Basic Behavioral and Social Science Opportunity Network (OppNet) Short-term Mentored Career Development Awards in the Basic Behavioral and Social Sciences for Mid-career and Senior Investigators (K18), RFA-OD-10-003; applications are due February 18, 2010. NIH Announces the Availability of Recovery Act Funds for Competitive Revision Applications (R01, R03, R15, R21, R21/R33, and R37) through the NIH Basic Behavioral and Social Science Opportunity Network (OppNet), NOT-OD-10-032; applications are due March 2, 2010. NIH Announces the Availability of Recovery Act Funds for Competitive Revision Applications (R01, R03, R15, R21, R21/R33, and R37) for HIV/AIDS-related Research through the NIH Basic Behavioral and Social Science Opportunity Network (OppNet), NOT-OD-10-033; applications are due March 25, 2010. NIH Announces the Availability of Recovery Act Funds for Competitive Revision Applications for Small Business Innovation Research and Small Business Transfer Technology Research Grants (R43/R44 and R41/R42) through the NIH Basic Behavioral and Social Science Opportunity Network (OppNet), NOT-OD-10-034; applications are due March 25, 2010. NIH Announces the Availability of HIV/AIDS Funds for Competitive Revision Applications (R01, R03, R15, R21, R21/R33, R37) for HIV/AIDS-related Research through the NIH Basic Behavioral and Social Science Opportunity Network (OppNet), NOT-OD-10-036; applications are due May 7, 2010. OppNet’s Web site has more details about the initiative and FAQs related to the funding announcements. As plans develop, the site also will include information about potential future initiatives and opportunities to provide input. To automatically receive updates, send an e-mail to listserv@list.nih.gov and in the body of the message include: subscribe nih-oppnet-l your name. To accommodate the transition to new application forms and instructions, NIH has temporarily extended the electronic application error correction window to five business days for applications due between January 25 and May 7, 2010. This allows additional time for applicants who may have inadvertently used the wrong forms to correct their applications. Please remember that applications using the wrong forms or that exceed the new page limits will not be reviewed. For more on the application changes, see my October 13 post. A new Recovery Act funding announcement from the NIH Office of the Director came out last week, and it offers plenty of opportunities for the NIGMS community. If you plan to apply for the NIH Director’s Opportunity for Research in Five Thematic Areas (RC4), think big! Only projects with budgets of more than $500,000 in total costs per year for three years will be considered. A key requirement is that the application must be for a research project—no bricks and mortar; no high-end, off-the-shelf instruments—although it can be for a project that develops infrastructure. Reinvigorating the biomedical research community by encouraging new collaborations and by recruiting and retaining new investigators (applications addressing this theme are still expected to be research projects). Since the funding is limited to three years, projects must have a high short-term impact. Applications for projects with a longer timeframe should include a plan for maintaining the research efforts without any expectation of further financial assistance from NIH. Letters of intent are due February 15, 2010, and applications are due March 15, 2010. If you have questions, you can e-mail or call me at 301-594-1158. We have just issued new program announcements to develop technologies for protein modeling (PAR-10-075, PAR-10-076) and high-throughput structural biology research (PAR-10-074, PAR-10-073). These announcements are part of the PSI:Biology initiative that will apply high-throughput structure determination to a broad range of biological problems. Advances in comparative molecular modeling and high-throughput approaches will play an important role in the success of this initiative. The protein modeling announcements aim to increase the quality of protein structure models. Because they promote collaborative research and exploratory approaches in developing novel comparative modeling technology, we encourage applications from new and established investigators in mathematics, physics, computer science, statistics or other quantitative disciplines. These announcements solicit proposals for improved experimental methods and techniques for all aspects of structural biology investigations. We particularly welcome projects related to proteins that aren’t currently amenable to high-throughput structural determination by X-ray crystallography and/or NMR spectroscopy. Successful applicants for all four announcements will become part of the PSI:Biology network. I can answer specific questions about the modeling announcements, and Charles Edmonds can answer questions about the high-throughput ones.